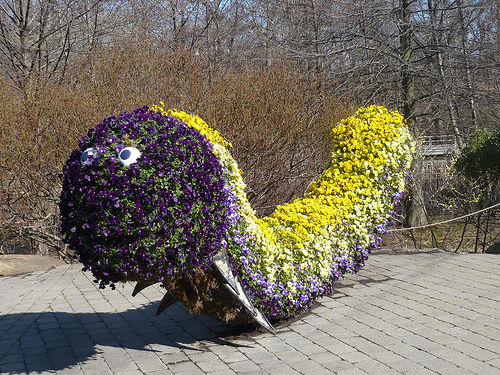 Brooklyn Botanical Garden – Go! A giant inflatable pig that disappeared from a US pop concert, floating into the night skies and the headlines, has been found in pieces in the desert. The helium-filled balloon, released during former Pink Floyd member Roger Waters’ act on Sunday at the Coachella Valley Music and Arts Festival in Indio, California, was discovered a few miles away. Concert organisers had offered a £5,000 reward for its return which will be split between two householders who found piles of pink plastic in their gardens without realising what it was. As tall as a two-storey house and as wide as two buses, the pig escaped and floated away as Waters played a version of Pink Floyd’s Pigs from the 1977 album Animals. “It wasn’t really supposed to happen that way. I don’t have the details,” festival spokeswoman Marcee Rondan said. The pig displayed the words “Don’t be led to the slaughter” and a cartoon of Uncle Sam holding two bloody cleavers. The other side read “Fear builds walls” and the underside read “Obama” with a ticked ballot box for Democratic presidential hopeful Barack Obama. The Portable Cellular Phone Booth provides a visual image of social sacrifices and opportunities to interact with one another lost due to our own self-involvement. The sculpture is a retractable phone booth that is carried on your back and can slide up and over your head to completely isolate you from society, kind of like the way a cell phone does. The action is fast and slick just like the flip action of a cell phone. Historically the iconic phone booth represented a place where one could go to be alone for a private conversation, transform into superman or travel through time. Today, it’s obsolete in most cities. With the Portable Cellular Phone Booth, one can transform from a member of society to one that is closed off. By delivering my sculpture to an unsuspecting public, anyone who notices the piece receives a myriad of messages from self deprecating humor to the neglecting of friendship in real time for the hope of something better. See what others dont see..